Can You Drink Epsom Salts? Is Eating Excess Mints Harmful? There is a saying, “all things in moderation,” that applies to the question whether eating too many mints can be harmful. While enjoying mints can have some benefits, eating too much of any one food can be harmful. In fact, ever food has pros and cons to eating it. Mint has been consumed for a long time because of the medicinal value it provides. While this is a beneficial herb in many areas, eating too many mints may be problematic. Can Eating Too Many Mints Be Harmful? Even with the wide use of natural, organic mint, it is best used for short periods and in small doses. There can be some side effects if you overconsume mint. Peppermint leaves are used in the creation of mint tea, one of the most popular teas around the world.It promotes digestion and can help relieve you of your headache. If you overconsume mint tea, you may see flushing or redness in your skin, skin irritations, irritated mucous membranes, headache and heartburn. Menthol is an active ingredient in mint tea. This ingredient can cause restriction of the wind pipes in small kids as well as in adults. If you have asthma, your doctor may say to avoid mint products. It is also recommended to not overconsume tea if you are pregnant or breastfeeding. Peppermint oil applied to children may cause breathing trouble. Those who are pregnant may be advised to not drink mint tea. What Is the Recommended Intake of Mint? For Tea: Steep a teaspoon of dried leaves of peppermint. Boil the water for ten minutes and then let the tea cool. It is recommended to drink this a few times throughout the day. As a Capsule: In pill form, you can take 1-2 capsules a day, unless you find you bowls become irritated. As Ointment or Oil: Apply ointment or cream to your skin to prevent irritation and itching. As Tincture or Spirit: This is a useful way to treat headache from tension. You can use a 90% ethanol, 10% peppermint oil tincture to apply to your head and allow time for it to evaporate. If you want all the benefits of mint, you must consume it in the right quantity. Stick to the above doses and you will avoid any pitfalls while enjoying the positive benefits of mint. Can eating too many mints be harmful? Yes. What about peppermint candies? 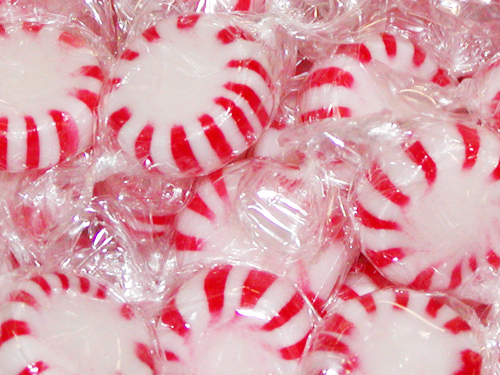 Peppermint candies are just that, candies without any real nutritional value and lots of sugar. There are no minerals or vitamins in the candies either. Ingredients and nutritional values vary between brands, but about three candies will give roughly 60 calories, all coming from corn syrup and sugar. You won’t find any fat, protein, sodium or fiber in the candy either. With the large amounts of sugar and no nutrition, eating many of these candies adds more empty calories to your day, which can lead to weight gain. If you eat three servings, or nine candies, and don’t leave out calories someplace else, you’ll add 180 calories to your day. This will add another pound to your waist every three weeks. This weight can add up over time. Because there isn’t any fiber in the candy but the high amount of sugar, it will also raise your blood sugar. It isn’t easy, but overdosing on peppermint oil, the common flavoring in these candies, can lead to unpleasant symptoms. With too much peppermint you can see rapid, shallow breathing, a slowed heartbeat, stomach pain, diarrhea, nausea, vomiting, bloody urine, dizziness, depression, twitching or unconsciousness and convulsions. It is primarily sugar and not much oil, which means you will need to eat large amounts of the candy to overdose on it. With the large amounts of sugar in these candies, you can cause cavities with over-consumption. Hard candy can be particularly bad for your teeth because they come in direct contact with the sugars which feed bacteria. This creates the perfect environment for decay and cavities. Chewing on hard candies can cause your teeth to break or chip.